What are your business chakras? But you are your business aren’t you? So your business chakras apply to what happens in your business. Your business has it’s own energy. You are more than your business and your business is more than you. So why not treat your business as the separate entity that it is? Firstly you need to ensure your own chakra system is balanced and flowing when problems arise in your business. Next balance the chakra system of the business. Then ensure yourself and your business are in alignment energetically so there are no mixed messages. I offer this as a Business ReSet Package message me for more details on this. Your Business chakras relate to the 7 main areas of your business. So where are they and how do they function. Image the business as a pyramid of energy starting from the base as the foundation of the business. Working up through the seven zone tier of the branding, the products, the relationship with customers, your message clarity, how you communicate your marketing, decision making and planning for the future. 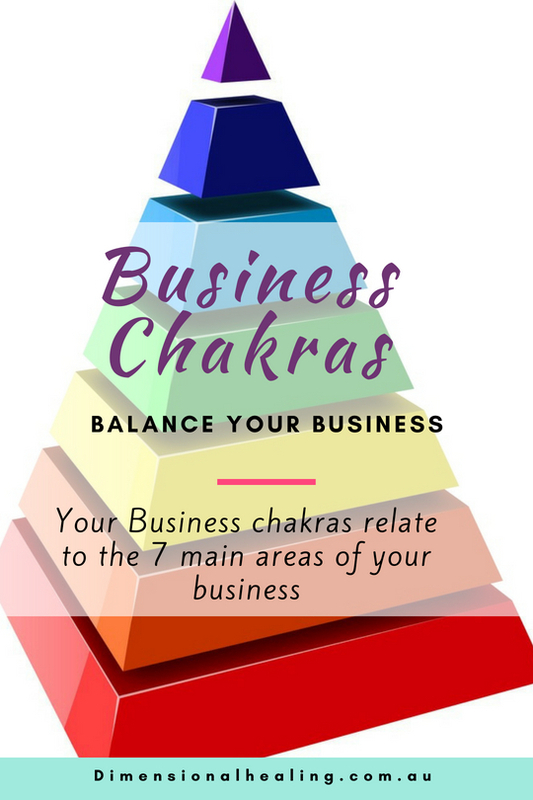 During your business chakras balance we look at issues happening within the day to day operations of the business to see where blocks are occurring then shift that energy. I clear and balance the chakra system of the business whilst also tapping into any intuitive insights on what the business needs to move forward. This gives you an action plan to implement.